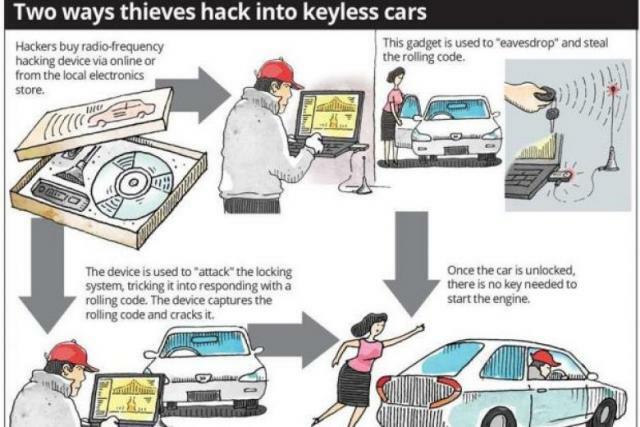 Owners of cars using the keyless entry system are at risk of having their vehicles stolen in minutes by a frequency­hacking device that is available in Malaysia. The device, which costs about RM150 (S$50) and can be obtained online or at some electronics stores, can unlock a car and start its engine by hacking its radio frequency identification (RFID) information. A source said the device could unlock almost any car with keyless entry. I still use the old school method to lock the steering but if they wanna steal they'll easily remove it anyway. Still, I think deterrence is better than nothing! maybe because it's relatable to us. how difficult is it to bring a computer along with the software into SG? Just need the software, a laptop and a cashcard and can drive out of the carpark oredy. So everywhere would be unsafe for the cars with keyless entry and starting system. Dont even need to drive across the causeway as i remembered even stolen cars in MY ended up in sg ports as a point of transit not too long ago. Only mechanical key start will be safe ? We are going back .. Deterrence does wonders. With a visible steering lock, thieves will just find it easier to steal another car (so many out there). The thing about the malaysian car thefts is, they are very flexible one, when you go high tech, they also go high tech, when you go old tech, they also can, they just do this. That's why I always use my key to lock the car door while in JB. But nowadays cars don't come with keys. Oh well. I mean how hard is it to just use the key to start a car? And I drive a manual transmission, confirm turn off a lot of potential car thieves. What about those that uses remote control locking system but key to crank engine? Nowadays, a lot of car don't have key hole to start a car. How to use key? This technology getting cheaper. So more accessible now. I bought those remote that can duplicate car key from taobao, so I guess they just need something that can work from further away instead of being just beside the remote to duplicate the key when the owner presses the button. What is the reason/logic behind aluminium being able to block the signal? almost like wearing a helmet with tin foil to stop alien from stealing your brain thoughts like the X men ? With the correct software, they just need a laptop, plug into the OBD2 port and program a new key. Software can be found quite easily for most cars. Original software cost is quite high. But there are pirated versions from China. Cover how many layers of aluminum foil is the best deterrence? ha ha like that arrh? But seriously, those what RF signal cannot penetrate aluminium? The canned food or drinks' can - are they made of aluminium?